I've done this walk a few times as a warm up for others. If you haven't carried an overnight pack for a while, this is relatively easy and for a couple of nights you can limit the pack weight. The walk out over the hills to Wineglass Bay is however quite strenuous. If you prefer, you can avoid climbing the hills, and return via the low route. You can do the circuit as a two-day trip if you like, but I prefer three. The main campsite at Cooks Beach is fine for two, or even several, nights. I went a couple of weeks ago, and weekday early November is pretty quiet down there. Day 1 - Carpark to Cooks Beach via Wineglass Bay Track and Hazards Beach. Day 2 - Daywalk from Cooks Beach. Bryans Beach, Mount Freycinet as options. Day 3 - Cooks Beach to carpark via Mount Graham and Wineglass Bay. A word of warning - water can be difficult to locate. Sometimes the only water is at Cooks Beach, occasionally that runs low. You may have to carry a significant amount to complete some walks safely and comfortably in hot weather. Check with the rangers to make sure there is water at Cooks Beach, and ask which other creeks are running. Walking here all starts at the tourist carpark where people walk to Wineglass Bay. It was busy in early November. I wonder how it would be at the height of summer. Complete the logbook, and head off up the hill. After 20-30 minutes you will arrive at the saddle. Drop your pack, and go to check out the view from the lookout. Then, continue and descend to Wineglass Bay. The beach and rocks here are worth a look. Sometimes whales can be seen too. Then head across the Isthmus to Hazards Beach, maybe 30 mins walk, and turn left to walk to Laguna Creek at the southern end. This beach has some interesting birdlife at times, and can be a good place to beachcomb for interesting finds (which of course you won't remove, because this is a national park). Laguna Creek can yield drinkable water if flowing. Head up the creek a little way to collect it. This is a good spot for a break, and there is some interesting geology in the foreshore rocks. The track continues south from here, and undulates gently through the forest for about an hour before emerging at the northern end of Cooks Beach. The track over Mount Graham departs inland from this spot, but walk south along the beach to the rocks at the southern end, and round the very small headland to Cooks Corner and the the campsite. There are plenty of tentsites here, spread along the dunes and back through the scrub to the hut. Water is in the tanks at the hut about 100m back from the beach, and there are composting toilets to the right as you walk up to the hut. You will find some bullants in places, and the sand is very fine and ends up in everything. The campsite is however quite sheltered, and is a great place to camp. Look out for visiting dolphins. On a pleasant evening it is great to sit on the rocks cooking dinner, watching the sunset paint the colours of the southern faces of the Hazards. If you want a relaxed day but want to do more than sit about, you can head over to Bryans Beach. Carry water, as there is rarely, if ever, any to be found at the beach or enroute. The track heads off past the left hand side of the hut, and provides about 40 minutes of easy and pleasant walking through the forest, before a short descent to the northern end of Bryans Beach, with views to Schouten Island. The beach is then open to be explored - including rock-hopping at the southern end, and some rough routes to the small hills at the far southern tip of the peninsula. Depending on your other plans, you could also climb Mount Freycinet as a daywalk. The views from the top are well worth the climb. Note that you can also climb this a s idetrip from the circuit continuation over Mount Graham. Allow maybe 5-6 hours return, depending on fitness and how long you want to spend sitting and looking at the view. The walk description follows in Day Three. This is the long day over the hills. Be warned - in dry weather you can't source drinking water anywhere between Cooks Beach and Coles Bay, so you will need to carry enough. This can take 6-8 hours of walking, plus the sidetrip to Mount Freycinet. On a warm to hot day you will need several litres at least. If you have good information from a ranger or someone who has just walked the track, you may be able to rely on getting water out of one of the creeks high on the southern flanks of Mount Freycinet, thus saving carrying some weight up 300m. Make sure any info is reliable. From Cooks Corner, walk north along Cooks Beach, and locate the signed track inland to Mount Graham. This heads off across the coastal plain, and then starts to rise, first gradually then more steeply. After passing through the East Freycinet Saddle, the track descends a little, before climbing again. Several creek crossings will be found around the 280-320m contours, on both sides of the saddle. The last creek that might contain water is Callitris Creek, but you may have to fill up further down from Jimmys Rivulet or Eastern Creek. Don't count on any of them. The track emerges at around 360m elevation in the saddle between Mount Graham and Mount Freycinet. To climb Mount Freycinet, turn left and head off uphill. This is a short but steep track, climbing about 260m to the rocky summit, over a distance that looks like only about 750m on the map. Parts of the track are very steep, most of it is rough and rocky, and some easy scrambling is required close to the top. Care will be required including on the descent, so don't hurry this too much. Views from the summit of the Hazards and Wineglass Bay, and indeed the rest of the park and surrounds, are superb. Try to work out which boulder is tallest, and maybe just climb them all. Mount Graham is reached by taking the main track which climbs about 220m, often steeply, and occasionally over slippery rock. The track passes very close to the summit of Mount Graham, where packs can be dropped for a 2 minute excursion to the left (north). Views to the Hazards and Wineglass Bay are nearly as good from here as from Mount Freycinet. Returning to the track, continue towards Wineglass Bay. This track isn't difficult, and much is downhill, but it is rough and steep in places, and will take a little longer than you had hoped given you have passed the high point. 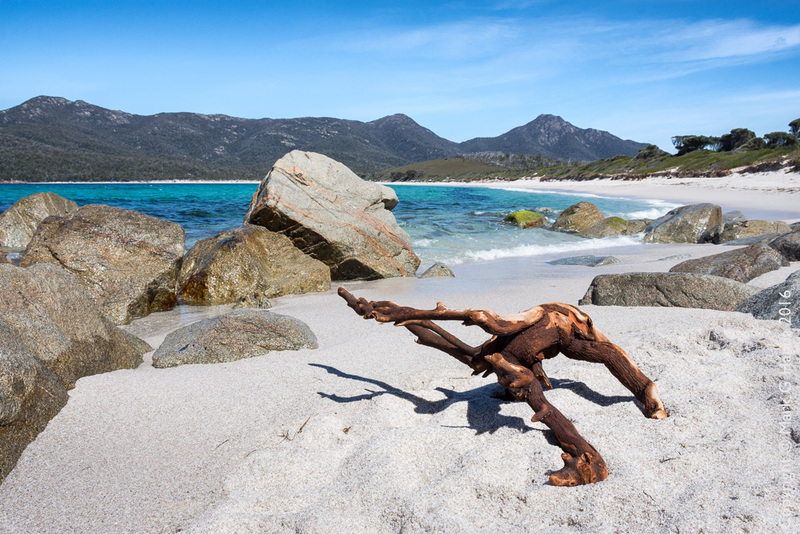 Eventually it emerges at the southern end of Wineglass Bay beach. There is a campsite here, but water is unreliable, and there is often quite a (natural) stench of rotting vegetation. This bit of the beach is very sheltered and is favoured for a dip. It is much safer and easier to have a dip here than along most of the rest of this quite steep beach. After a break, walk north along the beach, taking in the magnificent views of the Hazards sweeping down to the sea. These are always impressive, and the right light can make this vista absolutely spectacular. At the north end of the beach, take the normal track back over the saddle to the carpark. All in all, this is quite a long day and most people will feel they have had a good leg stretch.